Blurb: Dreamlike. This book changed the way I think. Review: Really, this book can be described in just that one word: dreamlike. The way that the romance, magic, and circus are all woven together makes the reader feel like they are floating along in the story. I felt like I was walking through the circus as I read. I would oftentimes say "oh!" out loud as I discovered something new and enchanting. Morgenstern is a master storyteller. The book is not very linear. There are multiple storylines happening at once, and they aren't all happening in the same time period; but by the end all of the stories converge in the same time, same place, and it's magical. What makes this book under "adult"? Well, for one thing the characters are definitely all adults. There are some adult themes (the mentors of the two children are... unkind. Not graphically so, but unkind nonetheless). There is one sexual encounter (again, not graphic, but also very obvious). And the book (true to its dreamlike nature) moves very slowly. You float from one idea to the next, and you'll gather up a lot of questions along the way. The answers to those questions take longer in coming. This might be frustrating to some people. But I definitely think a mature teen reader would certainly be able to handle this book. Speaking of frustrating, there were only two things that I would have liked to see in this book: 1) I wish we could have actually gone into the characters heads a little bit more. Sometimes they would say "I did this for you." But we don't know why they thought the other party would like it. 2) The magic was very... undefined. I'm still not sure exactly how they did the magic. The rules were confusing. BUT, perhaps if those two things had been changed, it would have lost its dream-like quality. That would be mucho-not-good-o. The people who interacted with me while I was reading this book know how much I love it. This is one of those books that I would run to the nearest person and say "Do you have a minute? I have to tell you what just happened!" and then I'd spend the next hour explaining the entire book so far, as well as my theories. It's a rare book that makes me do that (I can't remember doing it this much since Harry Potter and the Half-Blood Prince). And this book is rare. And amazing. I also adored this, even more so because Jim Dale reads the audiobook. This book sounds trippy. Are there clowns in this book? I refuse to read it if there is, but it sounds like a fun read. I'm so glad you reviewed this - I wasn't sure you would since it's adult. You described this book in the same way I would. I just felt almost like I was on muscle relaxers as I read it - it was the most unusual book experience I've ever had (in a good way). Loved it! Oh, and Kami's comment made me laugh! I don't remember any clowns, but even if there were, the book is not creepy circus. It's dreamy and almost fairy-like circus. I can't describe it. “Rare and amazing” are definitely words we would use to describe THE NIGHT CIRCUS as well. So glad that you enjoyed it! This was one of our favorite reads last year, and as you said, we definitely think it has cross-under appeal to young adults. 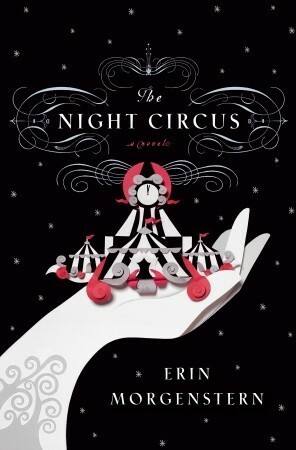 • THE NIGHT CIRCUS has been optioned for film. Can you just picture what a beautiful movie it could make?! • We went to see Erin Morgenstern when she came to our city to do a reading/signing, and she revealed what a crazy process – or lack thereof – she had when writing the book. Celia and Marco weren't even in the first draft! It was mostly just scenes of the different tents she wanted to feature. It took her dozens of drafts to develop the characters and their conflicts. I really enjoyed this book as well, I like how you broke down what makes this book "adult". I do think it has crossover appeal for YA readers.